The theme of today's "Tuesday Friday Reads" is LOVE. This is partially because of the books I read over the past week, and partially because I just finished watching "The Lizzie Bennet Diaries" on YouTube, and am still feeling the love. (If you haven't watched this vlog version of Pride and Prejudice set in the modern-day Internet era, and you like smart and swoony romance, you can catch up on the whole series now! Start HERE. You're welcome.) 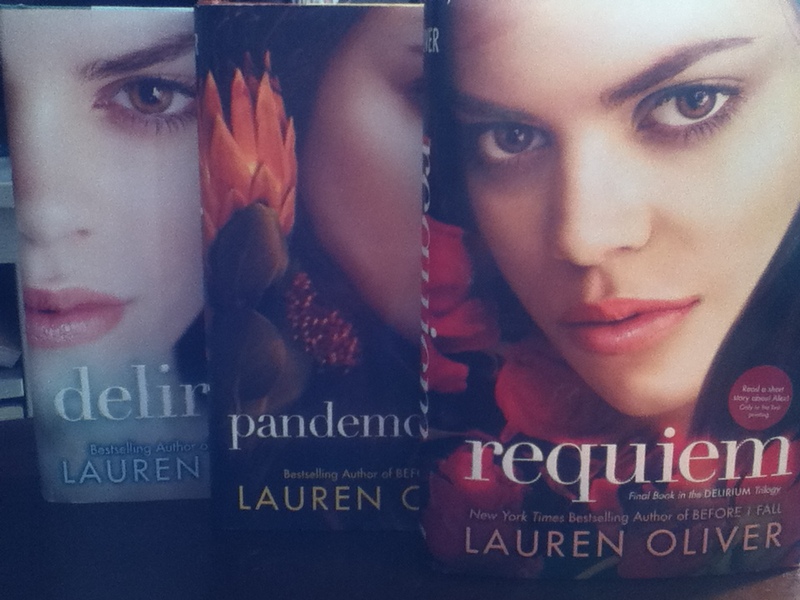 As promised in last week's post, I just finished Lauren Oliver's Delirium trilogy: Delirium, Pandemonium, and Requiem. I'd read the first two before, but wanted to refresh my memory in anticipation of the third one, which just came out. I really enjoyed this series! What's it about? Delirium is set in a future United States in which the government mandates a procedure that "cures" love—which is classified as a disease, amor deliria nervosa. Everyone has the procedure around their 18th birthday, and that keeps the adult world orderly, civilized, and disease-free. People who contract the disease—who fall in love—are rushed to an early, risky cure, or are shunned, or are thrown in prison to rot. Love means danger and pain and fear. This is a world Lena, the series' protagonist, knows, understands, and trusts—until she meets a boy who grew up outside her city's walls, who was never cured, who is part of a resistance movement against the cure and the government enforcing it. With Alex, Lena discovers that a life lived without love isn't much of a life at all. As she falls for him, she has to decide whether she wants to be cured and stick with the life she knows or succumb to the deliria and head out into the unknown. I'm going to try not to spoil the plot too much, in case you haven't read any of the books, but you can probably guess this bit: Lena chooses love. There are two more books, after all. But she discovers that life outside the government's control isn't exactly a dream. The uncured "Invalids" living in the Wilds struggle for every meal. They face diseases without medicine, face bitter cold without effective heat. They're on the run from the government's bombs and from soldiers sent to wipe them out. They're free to love, to feel, but they have to fight for it. Pandemonium and Requiem show that fight, both out in the Wilds and from inside the cities, first in New York and then back in Portland, Maine, where Lena grew up. One of the most effective things about this trilogy, for me, is the way it depicts love. Lena grows up believing that love isn't just wrong, it's a disease. People in her world don't even show affection, for fear that it could be the germ that turns into full-blown deliria. Lena's mom was cured, but her cure didn't work, and she eventually died (or did she?) from the disease—which means that Lena's only memories of affection are tainted. So, when she starts to feel something for Alex, it happens slowly, and not without a healthy dose of fear. That makes her choice to be with him and leave her life all the more incredible; she isn't just choosing love in a world that doesn't value love, she's choosing to give herself over to a disease that she believes will kill her, because she can't imagine an existence without love. Of course, over the course of the three books, Lena discovers the painful side of love: losing it can feel far worse than not having it at all. She questions her decision to remain uncured—wouldn't it be better to be spared the horrible pain of, for example, watching the person you love die? (Or maybe he didn't die...) She meets another boy, Julian, and she is for him what Alex was for her: a first love, cautious and scared and then wholehearted. Her relationship with Julian is something different than her relationship with Alex: sadder and wiser. She learns that you can need people for different reasons, that not all love is the same, and that loving someone for the here and now doesn't take away the love you bear for the memory of someone else. She learns that love can pull you through the hardest, darkest, most painful times. She learns that you can be better for loving someone, no matter how that story plays out. Again, I don't want to spoil the love story any more than that, because Oliver makes really interesting choices that go beyond the usual YA love triangle plot. Even at the end of Requiem, when in most YA love triangles one of the players would have either been killed or have clearly moved on to a consolation romance, Lena still has a difficult choice to make. That felt very real. Since my goal is to not spoil the plots of all three books, I'll just highlight one other thing that I really loved about this trilogy and this world. Throughout the story, Oliver inserts references to well-known works of literature and religion that have been twisted by this deliria-free government to suit a new purpose. Romeo and Juliet is no longer a tragic love story; it's a cautionary tale about how two teens get sick, go insane, and ruin their families' lives. In the Biblical story of Solomon, when Solomon is arbitrating a debate between two women who both say a baby is theirs, he cuts the baby in half as punishment for their attachment to it. (In the original, he proposes cutting the baby in half; the woman who gives up her claim to keep that from happening is the actual mother. It's a story of sacrifice for love.) Those are the two most prominent examples, but there are more. Including those references grounds the series in a world that clearly used to be ours, but is now very different. The stories a culture's leaders tell are so powerful, and at the end of Requiem, you have to wonder what new stories will be told, as this new culture transforms. I could go on and on about what makes these books so great, but suffice it to say, I highly recommend this series! From start to finish, it's an engrossing, powerful read. The third book broadens the world and raises the stakes without becoming so big that it's overwhelming and dwarfs the characters' private journeys (an issue I had with trilogy-enders Mockingjay and Reached). The cast of characters is wide-ranging and diverse, the villains are satisfyingly evil, and the love stories are, well...lovely. Read it! Coming up on Friday...more book-talk! Yay! Newer PostPostponing Friday Reads Because... I Have An Agent! !